Starting a business is one of the more common things that people do. When starting a business many people look to buy a franchise. This is a kind of business that allows a person to buy rights to operate a business but must follow policies by the parent company. One of the best ways to evaluate a franchise is to use a comparison. This is done by using an Excel template that will give you the ability to make assessments on the costs of starting a franchise as well as keeping track of things such as sales and income. By using this template you will have a great way to make the most out of starting a franchise business. One of the most important parts of the comparison of a franchise is the costs of starting. This is going over the fees, capital and costs required to pay in order to get started. It will also give you information on how much you will need to have in order to operate the business on a monthly basis each year. 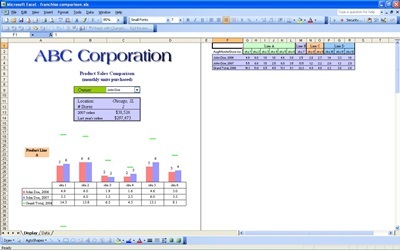 On the Excel template you will be able to list things such as the franchise name and then put down the headings such as franchise fees and initial capital. This part of the template will give you an idea of how much money you can allocate to start a particular franchise. The next part of a comparison of a franchise is the sales and income. This is when you use the Excel template to compare how much money you are making. It also allows you to make comparisons in regard to the amount of money you are making for a particular product and service. With this part of the template you will have a great way to evaluate what products and services are the most profitable in a more organized manner.